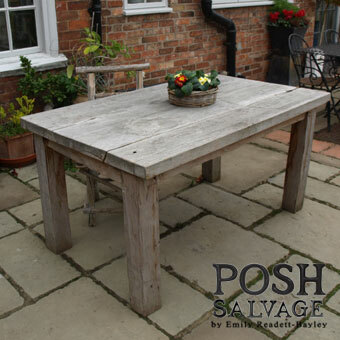 A reclaimed teak garden table made from salvaged teak from an old bridge. It has faded to a nice silver grey and you can really see the quality of the old wood. It will last many years in all weathers …they use teak for construction in the sea. Ideal for a terrace by the beach or a mountain chalet. It is heavy and will not blow away.